You've probably heard of the sugar substitute called stevia. 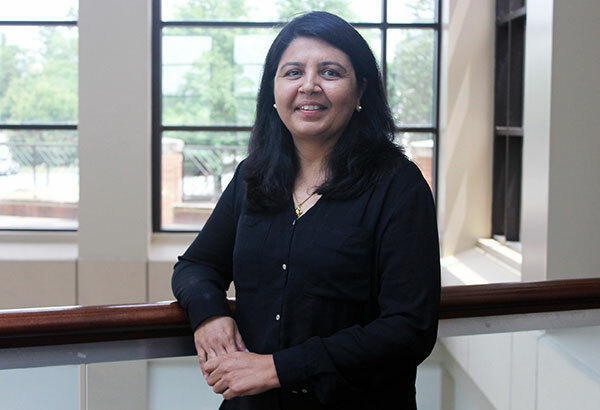 Dr. Pushpa Yadav, assistant professor of Biology, and some of her students have been conducting tissue culture research on this natural, zero-calorie sugar plant. Full Name: Dr. Pushpa Yadav. Full Title: Assistant Professor of Biology in the Department of Natural Sciences, College of Arts and Sciences. Degrees: Ph.D in Plant Cytogenetics from Meerut University, Meerut, India. Describe your service to Middle Georgia State University and to the community at large. "My major accomplishment has been to initiate, establish and sustain a plant tissue culture program to provide hands-on research experience to undergraduate students. Of course, this was possible through the generous funding and support of my department. The research project is on enhancing biomass production through induction of polyploidy in stevia, a low calorie sweetener plant to meet a huge demand, especially by diabetes patients. This project provided opportunities to several MGA undergraduate students to conduct research, analyze data and present their research work to their peers, faculty and other audiences. They also got the opportunity to attend professional conferences and to learn and interact with fellow students from other institutions and network with potential future employers and graduate schools. During this research, under my guidance, the students learned basic plant tissue culture techniques, including various sterilization procedures and their importance in scientific research; preparation of plant growth media and the importance of its individual components; measuring, recording and interpretation of data, etc. I feel that all the students who worked on stevia project enjoyed their time and grew up professionally. I am sure that will serve them well in their future careers. "In addition to mentoring, and providing research experiences to undergraduate students at MGA, I also collaborate with Fort Valley State University on a USDA-funded grant by contributing some laboratory exercises and teaching in workshops. The goal of this grant is to enhance the quality of animal science by incorporating hands-on experience in molecular technology and expose K -12 students to agricultural biotechnology through mini projects and workshops. The outcomes of this collaborative project were presented at Virginia Tech and published in NACTA Journal. "I enjoy teaching genetics course to biology majors, in addition to biology courses for non- majors. My effort remains to teach students through relating biology concepts to their lives. For example, when I teach how to construct a pedigree and how to deduce genotypes of individuals in a family, I ask students to choose one trait that is inherited in their family and build a family tree and deduce the genotypes of their family members and themselves. "I have also served as a faculty advisor for the Natural Science Network (NSN) student organization since 2013. The NSN promotes science through the school and community." "Prior to joining MGA, I was teaching at the University of Illinois at Chicago. My family moved to Georgia due to my husband’s job. MGA fit well with my educational preparation and it was growing. It is a community that I would like to help contribute to and grow with." "I love the environment of this school. It’s a community in which you develop a close relationship with your colleagues, as well as your students. The small class sizes give me the opportunity to really learn about my students, to be able to teach them better and see them develop into strong scholars and human beings." "Dedication, focus, hard work and self motivation are needed to do well in biology classes. These qualities are also transferable and will help students in their future endeavors, whether it be pursuing a job or further studies." "I am a good cook, and also enjoy sewing and painting."